A Girl Called Erika: Foxy. I can finally talk more about the awesome bag I made last weekend!! I only mentioned it briefly before because I wanted to make an identical one for my sister and I didn't want to blow the surprise. You understand, yes? Anyway, I had found this awesome fox print at Joann's a little while back and I knew I had to use it to make something for Holly. We love foxes, you see. I can't really explain why. I do know that our fox love probably started this one time (in 2007) when we were out and about with our grandparents and they were showing us some property they were interested in and we saw the skinniest little fox running across a field. We both got unnaturally excited and we have been obsessed with foxes ever since. Holly even gave me a sweater with a fox on it for Christmas. What a good sister she is. Here is a better picture of the whole thing (again with the blurriness!!) laying on the back of the couch. I believe the bag is meant to be reversible, but I used such a light fabric for the lining that I wouldn't reverse this one. Plus, I obviously love foxes too much to tuck them away inside. 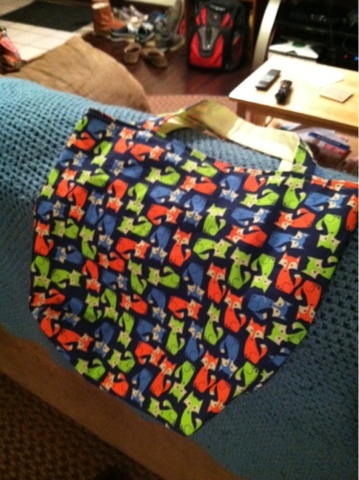 Sooooo... because I was so happy with the way my bag turned out, I decided to whip one up for Holly on Monday. I had the day off, you see. I spent the afternoon hanging out with Amanda and in the evening, I sewed up the bag. It took even less time than the first one. On my lunch break on Tuesday, I walked up to the post office near my office and sent it off. She got it on Thursday and was, as I expected, super excited about it. I asked for pictures. 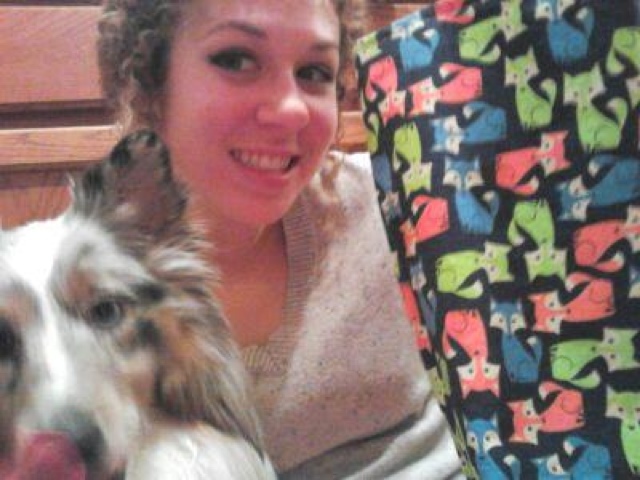 She sent me this picture of her, the bag, and Penny. I like it. I'm still trying to work on getting a picture of her carrying the bag. I'm hoping my brother in law will oblige. 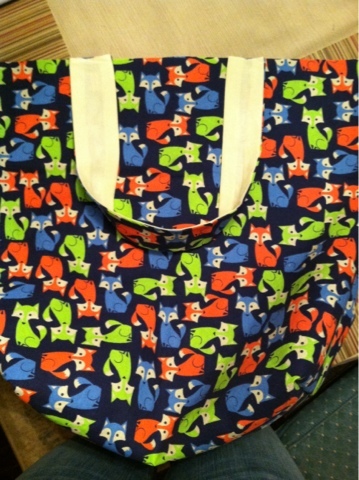 Yay for the fox bag! !